Red Bison Studio is handmade from start to finish. Located in Historic Downtown Sheridan, artist Stephen Mullins founded Red Bison Studio with the intention of not only doing what he loves for a living, but showcasing for the community the passion, hard work, and talent that defines an artist. Stephen’s roots are in Sheridan, but his work takes him far beyond Wyoming. He has sent pieces to several countries, including Australia and Costa Rica. You can also find his work in all corners of the United States from Alaska to Florida. His pieces aren’t just pleasing to the eye, but to the soul. Each one represents a story that brings up a feeling or a memory; whether it’s the Indian Paintbrush mug reminiscent of a warm summer day in a Bighorn mountain meadow or the mug with the classic bucking horse that we all take pride in. Seeing Stephen’s work still doesn’t do it justice. You have to feel the grooves and the smoothness of the glaze applied not by a machine, but by an artist. By having something handcrafted that’s made with love, it brings a sentimental value that you wouldn’t find with anything else. Sometimes it can be the little things that turn ordinary into extraordinary, and that’s exactly what Red Bison does. 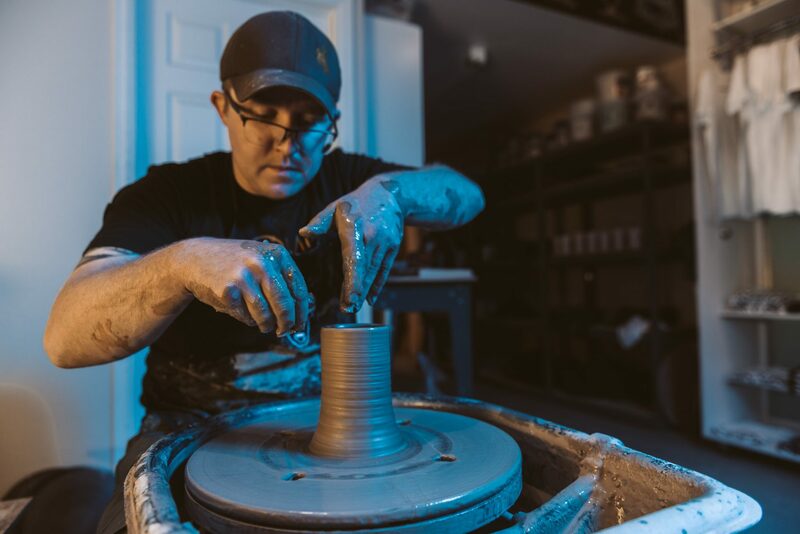 Stephen has worked with clay for most of his life but his passion for clay really came to fruition in his later years of high school, where he made pots in his garage to sell at local craft fairs. After receiving his Bachelor’s of Arts in Art Education and Bachelor of Fine Arts with an emphasis on ceramics, sculpture, and printmaking, he continued to master his craft in his garage while teaching. 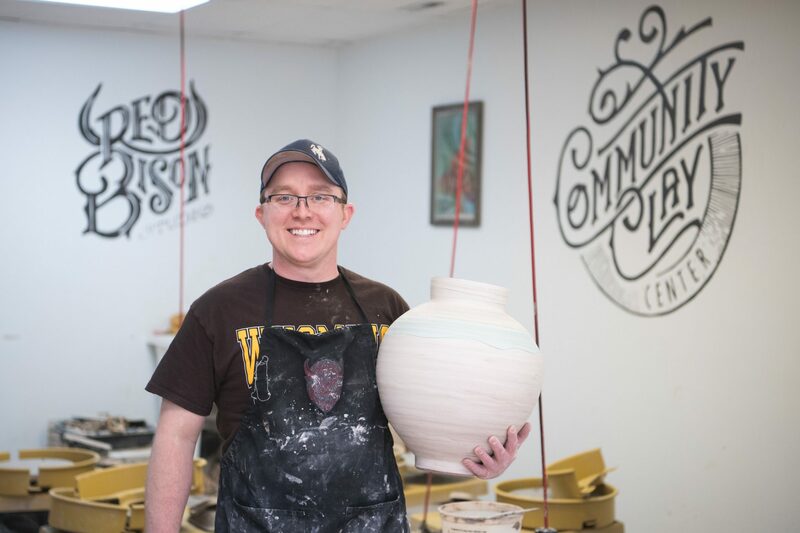 After four years of teaching ceramics at the high school, Stephen made the decision to pursue his passion for clay full time and establish the Red Bison Studio. In an age where handmade craftsmanship can be overshadowed by quantity over quality, Stephen and the Red Bison Studio make a bold statement by producing some of the finest and most authentic ceramic pieces in the country. Sheridan is fortunate that Stephen calls Wyoming home. Artists like Stephen bring so much value to the culture of Sheridan. In addition to our epic outdoor attractions and western hospitality, we have a thriving craft scene spearheaded by ambitious innovators. Being able to hike miles into the serene wilderness in the morning and attend a workshop at Red Bison in the evening truly makes Sheridan unique. Experience Stephen’s creations firsthand, and absorb some of his techniques at one of Red Bison Studio’s classes. Bring a friend, share some laughs, and create your own story to tell for years to come. You can see their schedule and reserve a spot with Stephen or purchase some of his work at redbisonstudio.com. You can also visit their shop on 227 N. Main St.